Mexico's mythology, like its population, reflects a blend of Native American and Spanish influences. Most people in modern Mexico trace their ancestry to Native Americans, to the Spanish who controlled Mexico for three centuries, or to both, in a mixed-race heritage called mestizo. In the same way, Mexican religion, myths, and legends are a blend of Indian traditions, European influences such as Christianity, and mixtures of the two. The Maya Indian villagers believe, for example, that the chacs, ancient rain spirits, are controlled by Jesus Christ and accompanied in their movement across the skies by the Virgin Mary, his mother. Mexican mythology is a product of syncretism—a process in which two belief systems merge to form one that is different from either of the original systems or in which a new belief system overlies an older one that has not disappeared. Background and Roots. Even before the Europeans arrived, Mexico was a land of varied cultures. Peoples who shared the Nahua family of languages dominated the north, while Mayan languages and culture were widespread in the south. Migration, trade, and war brought the different people and cultures of Mexico into contact with one another. These contacts led to syncretism in religion and mythology. As the Aztecs of northern Mexico embarked on wars of conquest and built an empire in central Mexico, they absorbed the deities of conquered peoples into their own pantheon. In turn, myths and religious practices from central Mexico filtered south to influence the Maya. The Aztec influence boosted the importance of the god Quetzalcoatl—known as Kukulcan to the Maya—and of human sacrifices to the gods. Spain conquered Mexico between 1519 and 1521 and governed it as a colony until 1821, when Mexico won its independence. During the three centuries of colonial rule, a new syncretism emerged, one that blended Indian and European beliefs. Spanish missionaries and priests strove to convert the Native Americans to Christianity and to stamp out their pagan religions. At the same time, some of the missionaries collected information about Indian beliefs, customs, and myths. Father Bernadino de Sahagun published accounts of the Aztecs that remain valuable sources of traditional lore; Father Diego de Landa did the same for the Maya. Roman Catholic Christianity did take hold in Mexico, and 95 percent of Mexicans now practice it. Yet the old ways did not completely disappear. A few Native American groups, especially the Huichol and the Tarahumara, remained pagan. Many others, however, combined Catholicism with surviving forms of pre-Christian beliefs and mythologies. For example, they identified Roman Catholic saints, whose feast days are scattered throughout the year, with the ancient gods, traditionally honored with agricultural festivals at specific times. Many legends surround Emiliano Zapata, a man who fought for peasants' rights during the Mexican Revolution (1911-1917). have also produced legends that have helped shape Mexico's image of itself as a nation and a people. Major Deities and Figures. Perhaps the most widely recognized and honored figure of Mexican religious mythology is the Virgin of Guadelupe. Tradition says that in 1531 the Virgin Mary appeared before a peasant named Juan Diego on Tepeyac, a hill to the north of Mexico City, and told him that she wished to have a church built there. When the bishop of Mexico asked Juan for proof of what he had seen, the Virgin appeared again to the peasant and instructed him to gather roses in his cloak and take them to the bishop. Juan unfolded the cloak before the bishop, and a miraculous image of the Virgin could be seen where the roses had been. Another tradition associated with the Virgin of Guadelupe says that a shrine to Tonántzin, an Aztec corn goddess, once stood at Tepeyac and that the Virgin replaced Tonántzin as the goddess mother of the Mexican people. However, there is no clear evidence of pre-Christian worship at that site. The Mexican people have long regarded the Virgin of Guadelupe as a sign of divine favor. They have credited her with ending an epidemic of disease in the 1700s and later with inspiring movements toward independence and liberation. Mexicans of all regions and all racial backgrounds are united in their devotion to the Virgin as an emblem of both religious faith and national pride. Among the historical figures who have acquired legendary status in Mexico are Hernán Cortés (1485-1547), the conquistador who overthrew the Aztecs and brought Mexico under Spanish rule, and Malinche, a Native American woman who assisted him as an interpreter of Indian languages. Malinche had a son by Cortés and later married one of his followers. In the past, Mexicans have condemned Malinche as a traitor, coining the term malinchismo to refer to favoring foreign things over those of one's own people or culture. In recent years, women writers and artists in Mexico have tried to create a more balanced image of Malinche. Legends also cluster around Miguel Hidalgo y Costilla (1753-1811), a priest and leader of the independence movement who died before a firing squad; Francisco "Pancho" Villa (1878-1923), a bandit turned revolutionary general; and Emiliano Zapata (1879-1919), a peasant who fought for peasants' rights in the Mexican Revolution. It is said that Zapata is not really dead but only sleeping. One day, like King Arthur of British legend, he will return to help his people. Some speak of hearing the hoofbeats of his horse Lightning as he rides through their villages at night. The term Black Legend refers to a centuries-old view of Spain and its people as particularly cruel, prejudiced, and greedy. Some of the literature that promoted the Black Legend came from European Protestants hostile to Catholic Spain. But part of the Black Legend emerged from the writings of Bartolomé de Las Casas, a Spanish bishop who served in Mexico and wrote a vivid account of the conquistadors' brutality to the Indians. Although modern historical research has shown that other nations were guilty of similar cruelties, traces of the Black Legend linger on as negative images of the Spanish element in Latin American culture. 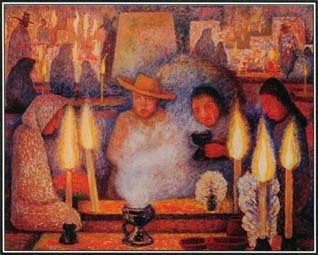 This painting by Diego Rivera shows people celebrating the Day of the Dead, November 2. During this Mexican holiday, families prepare altars with offerings for dead relatives. Deceased family members are believed to visit the world of the living on this day. heavenly bodies. One version identifies the evil creatures as ants, which cover Father Sun or Mother Moon with their huge colonies. Some Mexican myths explain features of the natural world. One story tells how the basilisk, a type of lizard, acquired the crest on its head. The Lord of the Woods announced that he would give a special hat to the animal that won a race. Most of the animals refused to compete, protesting that Big Deer was bound to win. However, to the amusement of all, the little basilisk said that it would race on one condition: all the animals had to close their eyes at the start of the race. The Lord of the Woods agreed, and Big Deer and the basilisk took off toward the stone that was their goal. When Big Deer arrived, he slowed down, thinking that he must have passed the basilisk long before. But to his surprise, as he prepared to sit on the stone, he found the basilisk there before him. The Lord of the Woods awarded the hat to the basilisk because he knew that the little creature had cleverly grabbed Big Deer's tail at the starting point and ridden it to the stone. Many Mexican tales contain, under their humor, criticisms of social injustice or of bad behavior by those in power. A legend about Pancho Villa, for example, says that he became a leader of men by selling his soul to the devil, who came accompanied by many kings, popes, generals, and cardinals of the church—all of whom had made similar deals. A myth about a hungry peasant tells of a poor man driven by desperation to steal a chicken and cook it. A stranger appeared and asked for some food. The peasant refused him. The stranger revealed that he was God, upon which the peasant declared that he would definitely not share with God, who favored the rich but was unkind to the poor. Another stranger appeared, asking for food. When this second stranger revealed that he was Death, the peasant gladly shared with him, explaining that Death was fair, taking the fat and thin, young and old, rich and poor equally. Legacy of Mythology. Several aspects of modern Mexican culture show the importance of myths in national life. Religious fiestas or festivals often combine pagan traditions with the worship of Christian saints. Mourning and funeral practices are also a syncretistic blend of Native American and Christian ideas. The ancient belief that people's personalities and needs continue unchanged after death leads to the custom of burying possessions and useful objects with the dead. A related belief is the notion that the dead can harm the living unless ceremonies are performed to keep them from doing so. On November 2, the people of Mexico celebrate a national holiday called the Day of the Dead. Images of death, such as skulls and skeletons, appear everywhere on toys, candies, breads, and masks; at the same time, families prepare altars with offerings for dead relatives, who are thought to visit the world of the living at that time. Some of the best-known art of modern Mexico includes images drawn from Native American, Christian, and revolutionary myth. The most noted painters of the Mexican School, José Clemente Orozco (1883-1949), Diego Rivera (1886-1957), and David Alfaro Siqueiros (1896-1974), produced murals that glorified the Mexican past, the Indians and peasants, and revolutionary ideals. Rivera's painting The Deliverance of the Peon illustrates his use of mythic symbols: the figure of Christ being taken from the cross represents the peasants who gave their lives in the Mexican Revolution. See also Aztec Mythology ; Basilisk ; Mayan Mythology .